Government indebtedness: Traditional safe heaven economies, such as the US, UK, Canada and France have a debt-to-GDP ratio well over 100 percent, and the case of Japan, reaching 250 percent. In the US deficits are surpassing the $1 trillion mark, thanks to impossible non-discretionary social programs at the time of the baby boomers' retirement age, as well as recently passed tax cuts. Debt auctions by the US Treasury have been slowly increasing and being met with mostly lukewarm enthusiasm, signaling future problems in refinancing. The CRFB estimates that interest spending will rise from $263 b. (1.4 percent of GDP) in 2017 to $965 b. (3.3 percent of GDP) in 2028. Depending on the relative health of the euro, and crowding effects in an expanding healthy private economy, interest rates above 3 percent could become the norm. 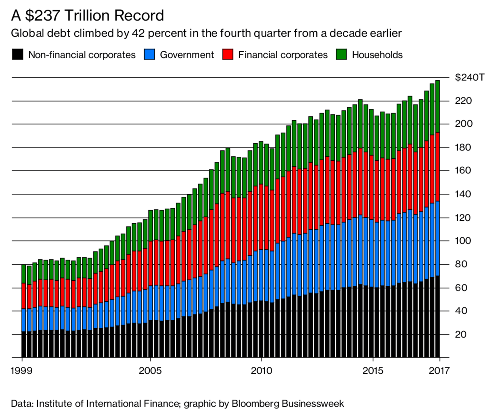 Based on a global sample of 13,000 entities, the agency estimates that the proportion of highly leveraged corporates - those whose debt-to-earnings exceed 5x - stood at 37 percent in 2017, compared to 32 percent in 2007 before the global financial crisis. Over 2011-2017, global non-financial corporate debt grew by 15 percentage points to 96 percent of GDP. There is no need to invoke things like increase in margin trading, the long-running bull market, possible overheating of the housing market, or other random points to overfit the idea. Is reducing exposure to bonds a good idea to hedge against (likely?) hikes in interest rates in the next few years? I see the economy healthy overall, with employment at near capacity, wages slowly inching higher, and personal consumption and indebtedness in better shape than in 2008, so holding passive mutual funds in stocks with broad exposure still seems like the wisest route. A minimal gold hedge is already factored in. I know you can look into futures contracts, ETN with inverse returns to government debt, CDS or other financial alchemy, but I like it simple, and don't know much. Reducing your investments in bonds would be reducing your exposure, not hedging it. Hedging an exposure is the act of taking positions which will benefit when this position is losing and vice versa. Is reducing exposure to bonds a good idea to hedge against (likely?) hikes in interest rates in the next few years? To answer your question, as said above this would not be a hedge so it can't be evaluated as a good or bad hedge. Let's play the game though, is it a good idea ? Well, it would be a good idea if you happen to be right. The problem is that we, mere mortals, are notably bad at predicting the future. Your analysis may be good (or not) but the results could be far from those you expect. The general advice given to neophytes, and also just to most people, is to diversify and not try to time the market (which is essentially what you are trying to do on the long term by adjusting your composition). I will assume that if you reduce your exposure to bonds, it would be in favour of stocks. If stocks nosedive and bonds do not, you just exposed yourself to a bigger loss. Not the answer you're looking for? Browse other questions tagged bonds debt government-bonds hedging or ask your own question. What is the best way to invest in gold as a hedge against inflation without having to hold physical gold? Is gold really an investment or just a hedge against inflation?